Over the last 2 years for which I’ve taught the Planning/EIA course at the Royal Thimphu College, I’ve been fortunate enough to partner with the Bhutan Ministry of Agriculture and Forests (MAF) to visit their research sites in the Woochu Watershed. The Woochu Watershed is a sub-watershed of the larger Pa-chu, which further unites with the Thimphu-chu to form the Wangchu Watershed. On March 27th I took 68 students, with our host Dr. Purna of the MAF, to explore various research sites throughout the Woochu Watershed. 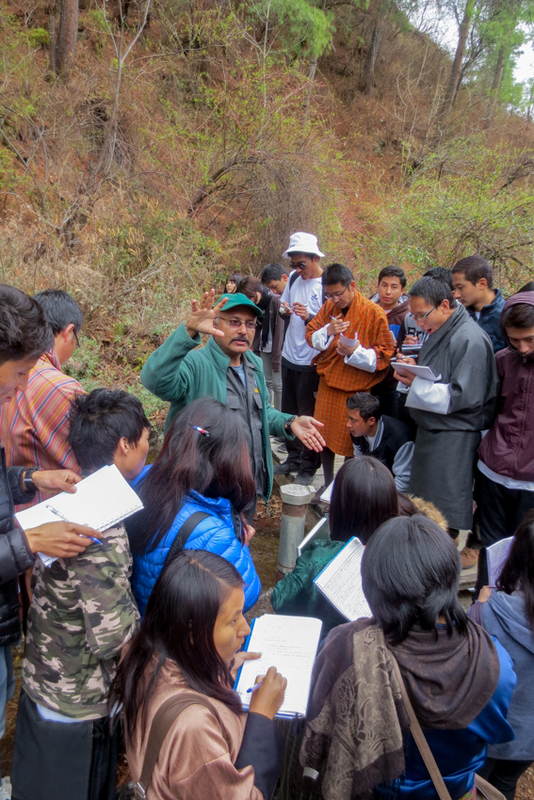 This area, located near Bonday on the way to Paro town, has been a key pilot project for the MAF to distinguish how various land uses effect water quality and quantity in the larger system. The key driver for such a study is the economy as the Wangchu Watershed contains a number of hydropower plants. Hydropower is the primary economic driver in Bhutan and is exported to India, thus there is motivation on behalf of the Government to promote healthy watersheds. As a class we were able to observe signs of the various land uses occurring in the watershed including agriculture, grazing, and illegal forestry. Data-loggers have been placed at strategic points in the system to measure stream flow and water quality; this data is used to compare sites of different uses and assess how each use positively or negatively impacts the watershed. There was a stark contrast between upstream monitoring stations and the outfall into the Pa-chu. Visually, students quickly recognized the decrease in water quality, with human settlements being the major culprit. 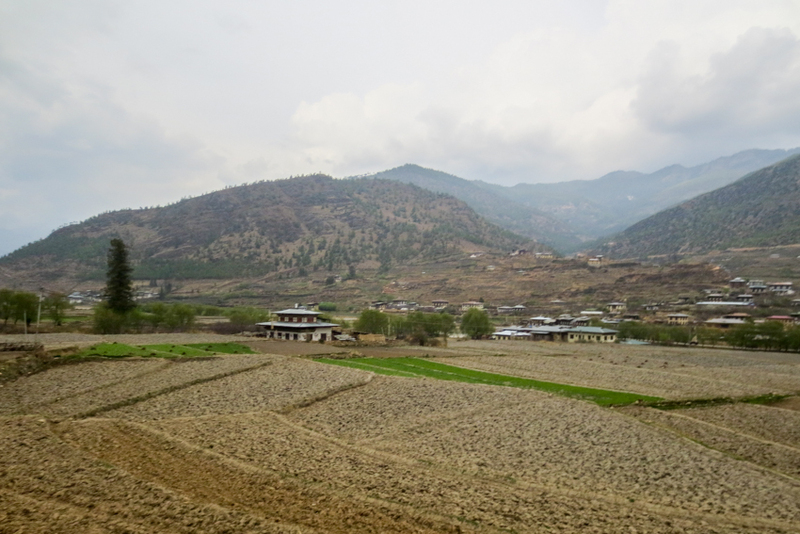 While Bhutan has a number of community-managed resources, mostly forest management units and a few watersheds, the Woochu is not one of them. Residents of Woochu have not yet linked the health of their watershed to their quality of life and socio-economic interests. Educational campaigns may help temporarily establish goals for watershed health, however empowerment and capacity building for a locally managed watershed could also meet such goals with the benefit of long-term sustainability. A Payment for Environmental Services (PES) arrangement has also been discussed in the past to help establish economic motivators for the community. Such a scheme would involve reserving a percentage of hydropower profits for upstream communities who willingly restrain their free-use of the water to provide improved water quality and quantity downstream for hydro-plant use. However, this idea has remained within the discussion of government researchers. Whether it is community-based management or a PES scheme, I believe that the Woochu Watershed would benefit from either, or a combination, of these strategies. Economic interests of the community need to be linked to the health of the watershed.